Is higher education teaching teachers to blend? In recent years, a lot of time and effort has been put into professional development and training for in-service teachers to prepare them to teach in a blended environment. Teacher preparation institutions have begun to take a more proactive role to improve preservice teacher exposure to blended teaching before they enter the classroom. For example, some states like Utah have even mandated that preservice teachers learn to teach effectively in blended environments. Additionally, new Teacher Educator Technology Standards published in 2017 included the standard that teacher educators “model blended learning strategies,” and “provide opportunities for teacher candidates to practice teaching … in blended learning environments.” We wanted to know if and where teacher preparation programs are addressing blended teaching pedagogy within their curriculum. And specifically, which teacher preparation programs—if any—deliberately include coursework on teaching teachers how to blend? To answer this question my colleague Jackie Jolly and I sent a survey to university administrators, deans, and faculty throughout the U.S. to start to gauge the type of coursework offered by institutions that address blended teaching pedagogy, or that offer graduate training in blended and/or online teaching*. As schools of education make updates to their programs, we wanted to know, beyond just technology integration, what current course offerings specifically address blended teaching pedagogy. 30% of undergraduate programs reported providing single courses dealing with technology integration, and blended teaching pedagogy may or may not be a topic covered in that course. 27% of the institutions that responded offer blended teaching pedagogy instruction for graduate-level instructional design students, who may or may not use these skills in a K-12 setting (instructional designers also work in corporate training and higher education settings). 18% of the responding institutions have M Ed. programs for graduate students which are focused on future school leadership that include some component of instructional design, technology integration or distance education component in the curriculum, which could prepare them for responsibilities as school leaders in a blended environment. Only 2 institutions had full programs that explicitly prepared future school leaders for leading a blended school. 15% of institutions that provided in-depth master’s degrees in education technology had no requirements for undergraduates to take an education technology course. This could be due to education technology being covered in other methods courses and integrated throughout the student experience. 33% of institutions offered a Master of Education degree online. First, which teacher colleges are using blended teaching as their delivery medium school-wide? While some programs tout their online program offerings, it’s harder to discover which colleges and universities use blended learning as a system-wide paradigm. Some researchers have constructed a framework for institutional adoption of blended learning in higher education, and perhaps this would be a good starting point for schools of education that want to implement system-wide reform that gives students first-hand experience in blended environments. Another way that preservice teachers could familiarize themselves with blended learning pedagogies is by taking teacher-led online courses. Experts have indicated that experience as an online student is desirable for blended teachers. Second, are there blended schools that offer internships or student teaching to preservice teachers? 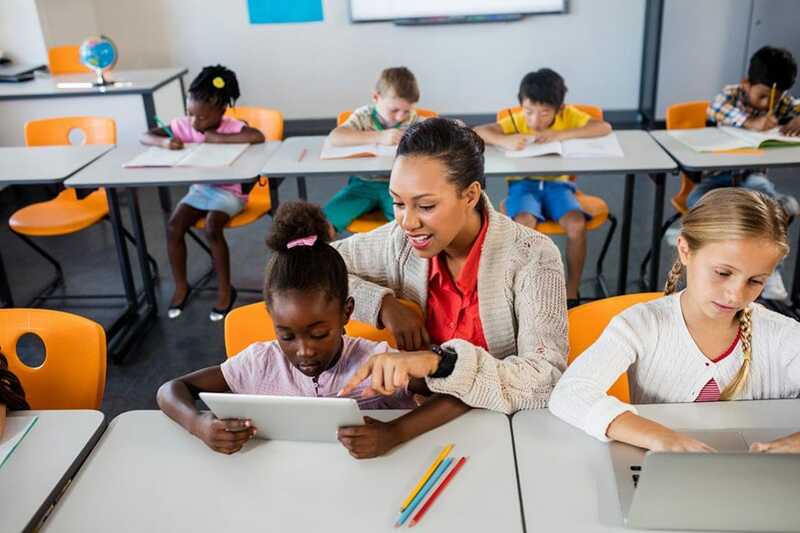 A recent study has examined what is offered to K-12 teachers in terms of a “virtual school field experience,” but the opportunities are few. Some blended schools, such as Summit Schools in California, are beginning to take teacher preparation into their own hands by creating their own teacher prep programs for blended teaching; could they also be persuaded to bring in student teachers from local universities? Other blended and personalized schools may not have the resources for creating their own teacher preparation programs but might be suited to take on undergraduate student teachers who could eventually teach at the blended schools. Third, what can we learn from higher education institutions that are emphasizing blended teaching in teacher preparation? It is feasible that in the future we will follow up with institutions that reported offering many kinds of coursework to prepare leaders and teachers for blended teaching in the classroom. We want to know what is working well, what are the challenges to these programs, and where they go for their curriculum about how to teach blended teaching to their students. The survey is simply the first step in understanding the ways in which higher education is addressing blended teaching skills. As some researchers have indicated, the term “blended” may simply go away altogether as online technology becomes mainstream in the teaching and pedagogical experiences of the future. Until then, some purposeful and probing research into teacher preparation is needed to identify institutions that are at the forefront of innovation and that prepare educators for blended environments. * Note: this survey was IRB-approved, and participants were assured that their responses would be kept confidential. Archambault, L., Kennedy, K., Shelton, C., Dalal, M., McAllister, L., & Huyett, S. (2016). “Incremental progress: Re-examining field experiences in K-12 online learning contexts in the United States.” Journal of Online Learning Research, 2(3), 303–326. Kolb, L., Kashef, F., Roberts, C., Terry, C., Borthwick, A. (2018, March). Challenges to Creating and Sustaining Effective Technology Integration in Teacher Education Programs. Paper presented at American Association of Colleges of Teacher Education Annual Meeting in Baltimore, M.D. McAllister, L., & Graham, C. R. (2016). “An analysis of the curriculum requirements for all online k-12 teaching endorsements in the U.S.” Journal of Online Learning Research, 2(3), 247–282. « Do specialized teaching roles help or hurt students?